The Airpod 101 was designed and manufactured by Air Affairs for special mission applications. This rectangular subsonic pod is flight cleared and certified on the Learjet 30 series aircraft and a variety of configurations are available. The main structure beam attaches to either 30 or 14 inch wing stores racks and supports the five bulkhead frames. Formed upper and lower skin panels provide pod rigidity and easy removable side panels. Forward and aft fairing's or radomes are installed to complete the assembly. 4 equipment bays can hold standard 19 inch rack mounts. Access from front and rear and sides, permits unlimited installation options. Panels fit to preclude moisture. Nose and tail fairing's can be supplied as radomes, optically clear for video or photography or of a standard fibreglass construction. 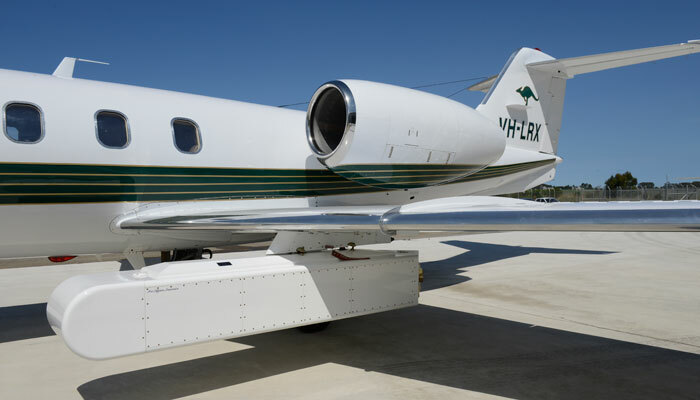 The Airpod comes with a full engineering package approved by Australian CASA, German LBA, FAA and flight clearance on Learjet to 35,000 feet and 0.80 mach and has a 792 lbs payload capacity. The Airpod is in service as an EW pod for the German Air Force, Singapore Technologies and is fitted with survey and IR scanners in Australia.